SSHH! Don’t Wake Dad Game SSHH! Don’t Wake Dad is an entertaining and suprisingly tension filled game! 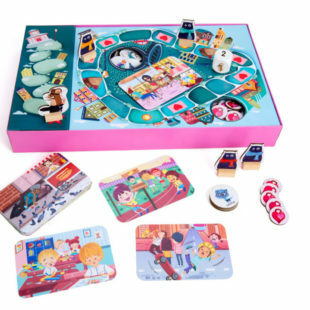 The game features a board, spinner, cards, movers and a bed featuring a sleeping (snoring) Dad. The idea of the game is to sneak around the board to the fridge in order to pilfer the luscious chocolate cake without ..
SSHH! Don’t Wake Dad is an entertaining and suprisingly tension filled game! 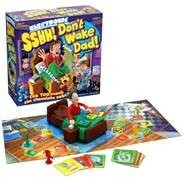 The game features a board, spinner, cards, movers and a bed featuring a sleeping (snoring) Dad. The idea of the game is to sneak around the board to the fridge in order to pilfer the luscious chocolate cake without getting told off by Dad. Players spin the spinner to move, then when they land on board spaces have to show that they have the right card to match the space they landed on, if they don’t have that card the space shows them how many times they have to press the alarm clock next to Dad. A seemingly random number of presses on the alarm clock eventually triggers an explosion from sleeping Dad (he literally sits up in bed and yells!). Any players waking him up must return to the start along with any players in the process of tip-toeing over his bed when he wakes up! In terms of the playing experience, firstly the instructions/gameplay is very easy to pick up. When play begins the game becomes filled with tension as a player learns she or he must press the alarm clock…and the tension grows with each press until finally Dad explodes. We found some of the younger players tended to try to sneakily not quite press down the alarm clock enough to actually trigger a click, but this was all part of the fun and banter! The main playing mechanism of Dad in bed was surprisingly robust and functionally efficient for this kind of game. Sometimes in order to keep prices down this kind of game can end up with flimsy units which don’t feel like they will last for long, but that was definitely not the case here. The snoring sound effect really added to the atmosphere and the process of nearly getting there but then being sent back to the beginning gave just about the right level of challenge (albeit entirely luck based). WHO’S IT FOR: The box states the game is suitable for players of 5+, and we tend to agree with this. There is no text on the cards used in the game, apart from single digit numbers. Kids could play this alone, or with their parents. THE TOY VERDICT: SSHH! Don’t Wake Dad is an entertaining game filled with tension and excitement with good repeat play value. Recommended.